Vandana Shiva is a renowned Indian scholar, environmentalist, and anti-globalization activist. She has authored more than twenty books. She is one of the board members of the International Forum on Globalization. She has championed the wisdom of many traditional practices. She is a member of several international committees on environment, organic farming and traditional agricultural system. Shiva has participated in the non-violent Chipko movement, which was against deforestation, during the 1970s. In 1993 she was awarded the Right Livelihood Award, commonly known as the “Alternative Nobel Prize”. 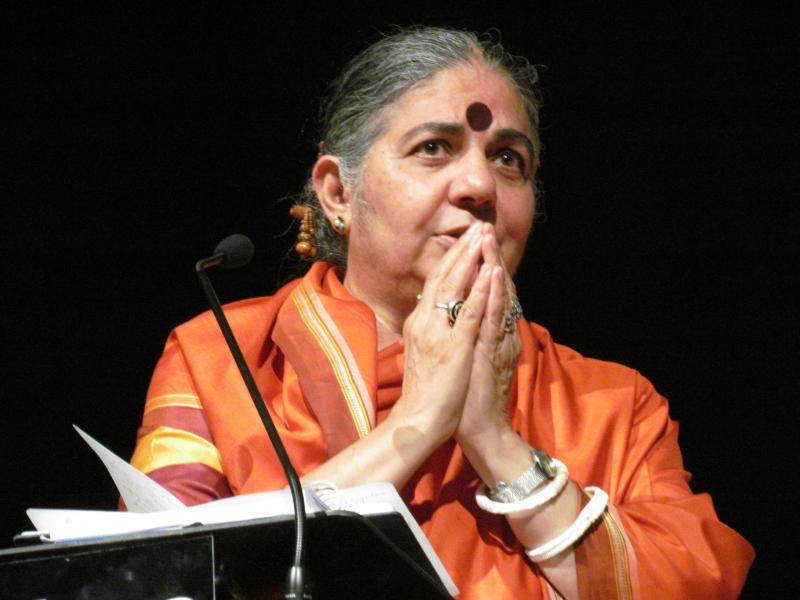 Vandana Shiva was born on 5 November 1952 in Dehradun, which is now in the Uttarakhand state of India. Her father was employed as a conservator of forests while her mother was a farmer. She had her schooling at St Mary’s School in Nainital and the Convent of Jesus and Mary in Dehradun. Shiva graduated in Science from Panjab University in Chandigarh, in 1972 and later acquired her Masters degree in 1974. Thereafter, she worked at the Bhabha Atomic Research Centre. In 1977, she left for Canada to pursue an M.A. in the philosophy of science at the University of Guelph (Ontario). In 1978, she received her PhD in philosophy at the University of Western Ontario. After returning back to India, she went in for interdisciplinary research in science, technology, and environmental policy at the Indian Institute of Science and the Indian Institute of Management in Bangalore. In 1982, she started the Research Foundation for Science, Technology and Ecology (RFSTE). This was followed by the creation of Navdanya in 1991. This was a national initiative to protect the diversity and integrity of living resources, such as native seed, promoting organic farming and fair trade. In 2004, in collaboration with Schumacher College, U.K. she started the Bija Vidyapeeth, which was an international institution for sustainable living in Doon Valley. Through her research Foundation, she worked aggressively In the area of intellectual property rights and biodiversity, and challenged the biopiracy of Neem, Basmati and Wheat. In 1988, she wrote her first book, Staying Alive, which helped redefine perceptions of third world women. Her work on agriculture started in 1984 after the gas leak in Bhopal from Union Carbide’s pesticide manufacturing plant. Her studies were published in her book The Violence of the Green Revolution. In 1990, she wrote a report “Most Farmers in India are Women” for the FAO on Women and Agriculture. She also founded the gender unit at the International Centre for Mountain Development (ICIMOD) in Kathmandu. She was also a founding board member of the Women’s Environment & Development Organization (WEDO). She has also served on the expert groups of government on Biodiversity and IPR legislation, and has also served as an adviser to governments in India and abroad as well as NGOs. Shiva had chaired the Commission on the Future of Food set up by the Region of Tuscany in Italy and as a member of the Scientific Committee of Spain. Shiva is also a member of the Steering Committee of the Indian People’s Campaign Against WTO. Shiva serves on Government of India Committees on Organic Farming. She has worked to promote biodiversity in agriculture to increase productivity, nutrition, and farmer’s incomes. For her work she was honoured as an ‘Environmental Hero’ by Time magazine in 2003. Shiva argues that the seed-chemical package promoted by Green Revolution agriculture has depleted fertile soil, destroyed living ecosystems, and negatively impacted people’s health. She provided data that over 1400 pesticides enter the food system across the world, as only 1% of pesticides act on the target pest, and the residual chemicals cause cancer, kidney failure and heart disease. On Seed Freedom – She believes in the idea of seed freedom and rejection of corporate patents on seeds. She campaigned against the implementation of the WTO 1994 Trade Related Intellectual Property Rights (TRIPS) agreement, which broadens the scope of patents to include life forms; calling the patenting of life as ‘biopiracy’. In 2005, Shiva’s organization won a 10-year battle in the European Patent Office against the biopiracy of Neem by the US Department of Agriculture and the corporation WR Grace. In 1998, Shiva’s organisation Navdanya began a campaign against the biopiracy of Basmati rice by US corporation RiceTec Inc., which lost its claim to the patent in 2001. On Golden Rice – Shiva strongly opposed Golden rice, which is a genetically engineered breed of rice that biosynthesize beta-carotene, a precursor of Vitamin A. Shiva claimed that Golden Rice is more harmful than beneficial, and called it the “Golden Rice hoax”. On Genetically Modified Seeds – In her view, the creation of seed monopolies, the destruction of alternatives, the collection of super-profits in the form of royalties has caused debt, suicides, and agrarian distress, as nearly 75 percent rural debt is due to purchased inputs. 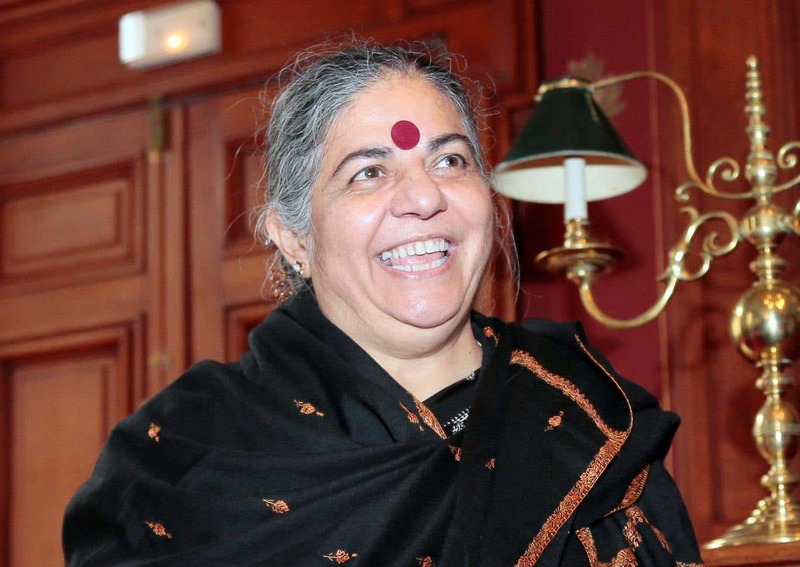 On Ecofeminism – Vandana Shiva has played a major role in the global Ecofeminist movement. In contrast to the prevalent “patriarchal logic of exclusion,” she claims that a woman-focused system would be a extremely positive step. Vandana Shiva’s work has always been found to be controversial by her adversaries. In June 2014, there were reports that Navdanya and Vandana Shiva were named in a leaked, classified report by India’s Intelligence Bureau (IB), which was submitted to the Indian Prime Minister’s Office. The IB said that Indian NGOs, including Navdanya, receive money from foreign donors under the ‘charitable garb’ of campaigning for human rights or women’s equality, but the funds were used for nefarious purposes. In 2014, it was also revealed in an article in Discover journal that Shiva charges US $40,000 per speaking lecture, plus a business-class air ticket from New Delhi. Vandana Shiva is an environmental activist, but has also been a very controversial figure. However, there is absolutely no doubt that she has championed the cause of abolition of the use of chemical pesticide, herbicides and fertilizer. She has written and spoken extensively about advances in the fields of agriculture and food and brought awareness against the use of genetically modified seeds and terminator seeds. She has also focused public attention on the degradation of soil and the negative health consequences of technology in agriculture, which proves counter-productive in the long run. She has assisted organizations in Africa, Asia, Latin America, Ireland, Switzerland, and Austria with campaigns against advances in agricultural development via genetic engineering. Sustainable agriculture is what is required to ensure that the generations of human kind live healthy.